You start off in the titular Horus Station, floating around aimlessly with the station clearly operating on emergency power only. There’s no pre-game cutscene or text and given that you don’t want to die a space peasant’s death, your only option is to press ahead. Initially your movement is quite limited. You hold the left stick in the direction that you want to float and then release it to spring forward or grab scenery with your Move controllers and sort of push yourself off, letting physics do the rest. It’s a pretty inefficient way to get around but before long you’ll pick up a grappling gun that you can use to pull yourself around the station and later you’ll get a small handheld thruster that is a tad faster but less precise. It’s a cumbersome method of movement but it does fit well with the zero gravity setting even if it does bring the game’s pace down to the minimum acceptable level. You’ll definitely be squeezing the hell out of that trigger button, trying to get more speed out of your grappling gun but you’ll never get the acceleration you’re craving. The station is pretty much non-functioning. 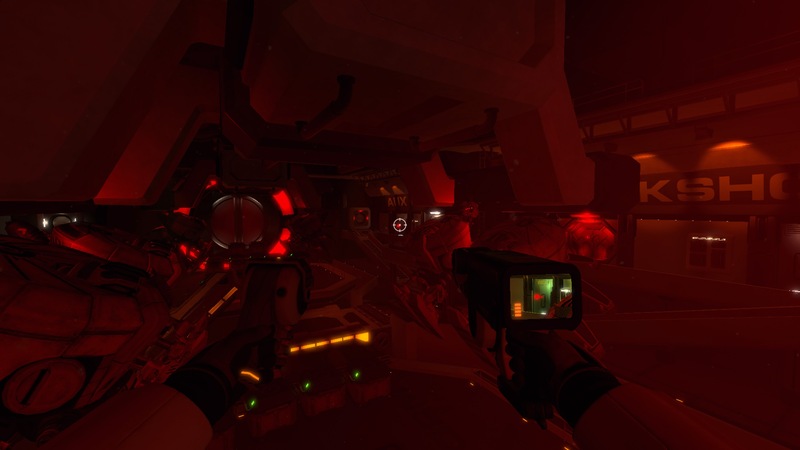 Red lights glow, screens show warning messages which act as your only mission pointers and most of the doors are locked. Oxygen doesn’t seem to be an issue though as there is no O2 indicator anywhere. Unfortunately though the station’s defences are operational and also see you as a threat. They’ll fly towards you and try to elimate you but if you die you’ll just respawn at the nearest medbay. These act as checkpoints and are very plentiful which ultimately means that death doesn’t matter a whole lot in Downward Spiral. 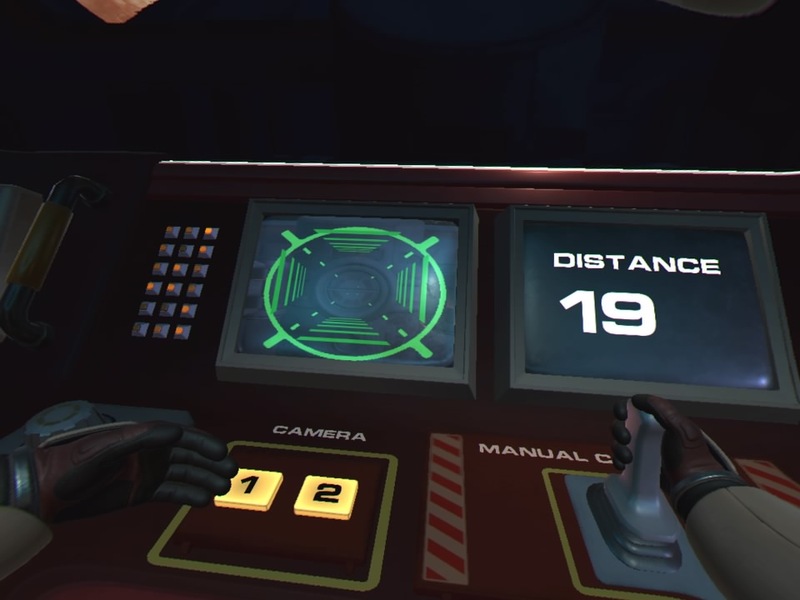 In terms of finding your way around, Horus Station is fairly easy to navigate. Unlocked doors are green and most of the time your way ahead is fairly linear. At first it’ll just be doors, then it’ll be doors with switches, then those switches will need powering on with some other object in the room and ultimately those objects will be in other rooms. When it comes to the puzzles, if you can call them that, there are no real brainbusters and often the only difficulty comes from not really knowing what the game wants from you sometimes but it’s usually pretty easy to work out. The game has eight levels, or acts as it likes to call them, with standard sci-fi names like ‘Catalyst’ or ‘Icarus’ and whatever. Each act lasts around 30 to 60 minutes but if this was a game with gravity and a mini-map, they’d take about five minutes each. 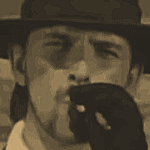 There’s not much variety between acts both in terms of the visuals and the gameplay. Once you know about, say, putting a disc in a drive to boot up a terminal the next time you see that problem there might be two discs to find and that’s pretty much how all of the puzzles progress. Combat happens now and again and while it’s not the most exciting combat we’ve ever seen, it does liven things up a bit and combat handles pretty well thanks to the decent controls. As we said before, this is VR-optional but outside of VR there’s no real reason to play this. Sure, it’s functional but there’s not enough going on to make it interesting. In VR you get two main improvements. The first is with the controls. The game lets you hold two tools or weapons, one in each hand. So you might have your grapple gun in your left hand and a gun in your right. With the Move controllers, this feels very natural and flexible. You can also holster them and use the Move controllers to control your hands, allowing you push yourself around and grab onto surfaces and you’ll need an empty hand to open the many doors that you’ll find. The other improvement is in terms of the atmosphere. Sure, Downward Spiral isn’t the most interesting looking game. 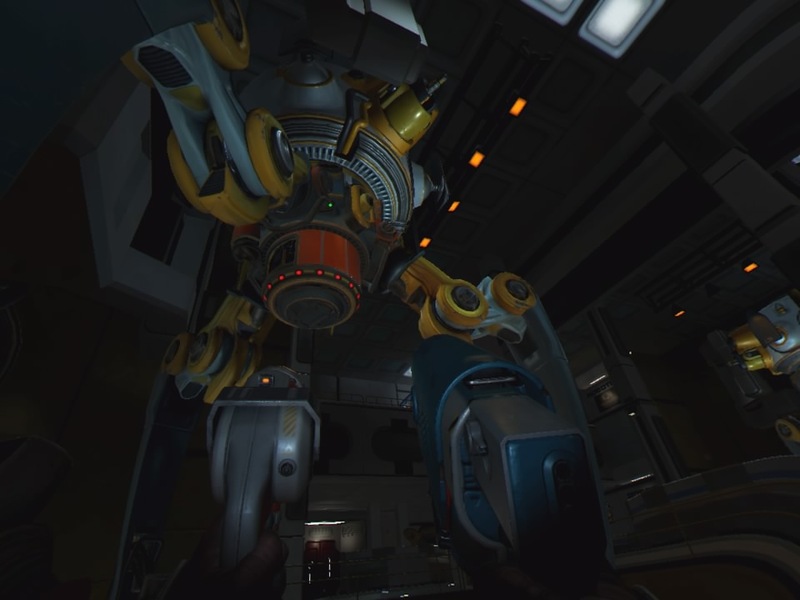 It’s pretty much sci-fi 101 in terms of dark corridors, occasional views of space and random lights on control panels but in VR, you get much more of a sense of being there. 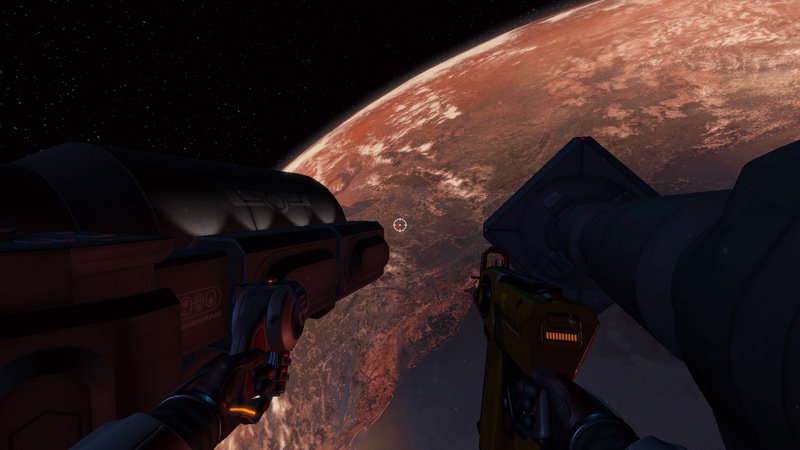 As a first-person game, having the headset on does make you feel like you are actually floating around a space station even if we’ve personally lost that VR effectiveness these days. If this had come out as a VR launch title it would have been quite something. Back then anything with VR got a bit of a score boost just because it was such exciting tech. These days that no longer applies and because Downward Spiral also works without VR, it does starkly reveal the game’s limitations. Essentially the game is a cross between the menial space fix ’em up Dead Space, Tower of Guns (but with fewer guns) and Descent. However, the action is so sparse, the puzzles so minimal and the story so lacking that it ends up feeling like a tech demo. In fact, if they had squeezed this game into a 15 minutes demo, you’d probably have not lost anything particularly meaningful in terms of gameplay. In the end it feels like a walking simulator, or floating simulator if you want to make the obvious gag, and that’s a shame because it’s so obvious what this game needs. Sci-fi can go one of three ways. You’ve either got the space opera type of story which this doesn’t have because there are no people to talk to, the space horror thing (like Alien) or the space disaster story. By that we mean something like the film Gravity and that’s the problem here. You see, Downward Spiral is closest to Gravity in terms of any story we’ve seen but at least Gravity had things exploding all the time. There’s no destruction here. It’s like all the interesting stuff happened before the game started. So if they had put in a bit more spectacle and maybe threw in some scary stuff, not just drones and whatever, this could have been great. Instead it’s all just a bit ordinary but here’s the thing, I did enjoy it. Sure, it’s getting by on doing the absolute bare minimum but Downward Spiral was hard to put down and I was happy to keep pushing on until the end to see if a story developed which, unfortunately, it didn’t. The game offers online co-op, deathmatches and a horde mode but at the time of reviewing these modes were a bit dead. There’s scope for some decent battles here though as the basic combat is pretty good. I can’t say I didn’t enjoy my time with Downward Spiral but I wish it had done more. You do feel like you’re in space and the tools you have at your disposal make the combat a fun diversion from finding buttons to press. With a little more ambition, this could have been a really great title for PSVR but right now that score you’re seeing is a little generous and without VR you’d be looking at half that. 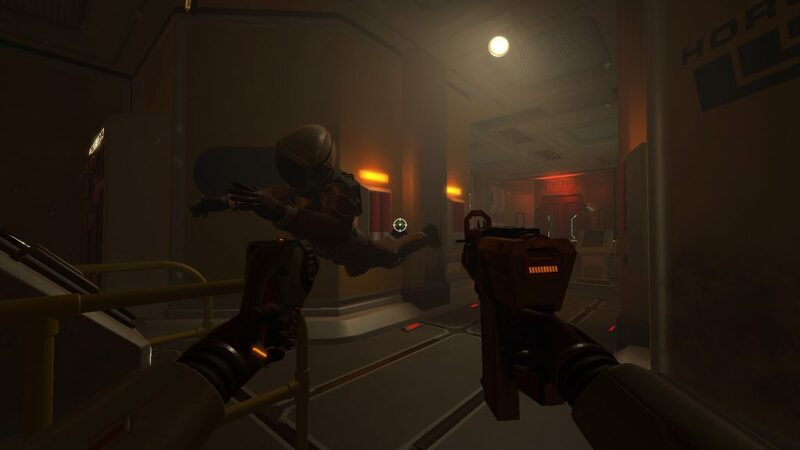 Downward Spiral is a zero gravity space adventure that mixes the worst bits of Dead Space, Descent and every walking simulator ever but somehow remains intriguing and relatively tough to put down.